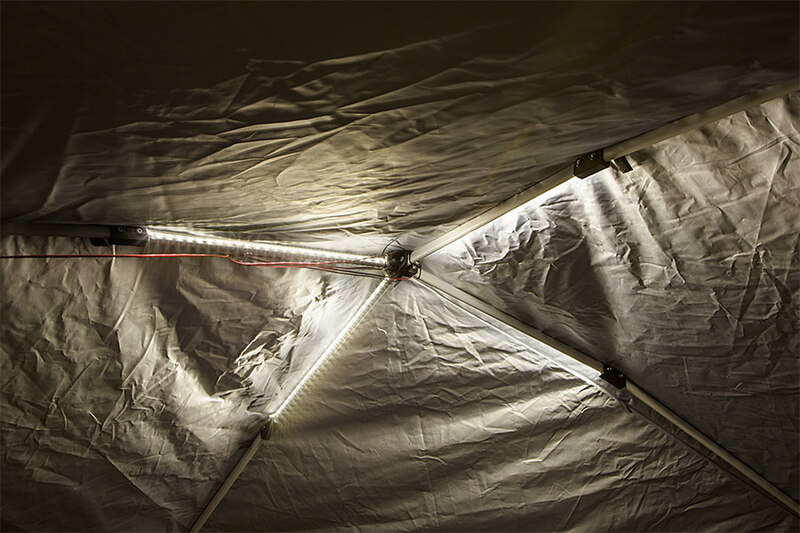 Portable Canopy Tent LED Lighting Kit: Mounting Hardware including 10 Zip Ties, 2 3M Mounting Pads, And A Velcro Band. 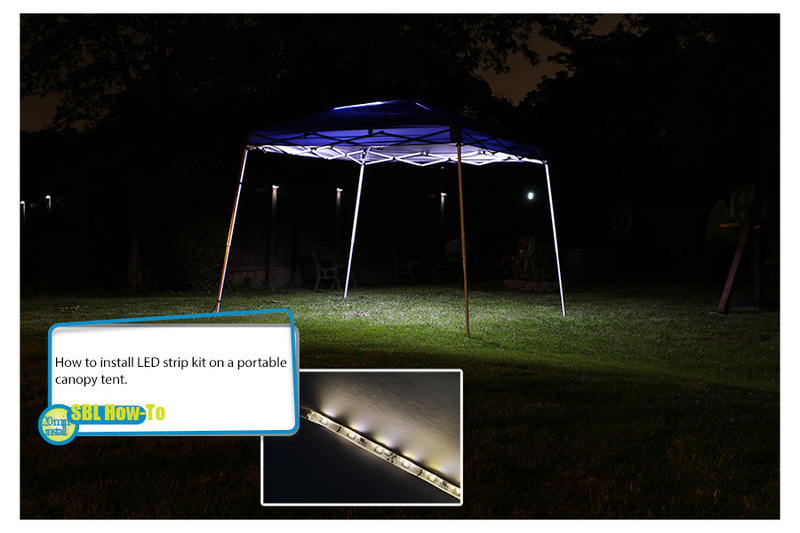 Portable Canopy Tent LED Lighting Kit: Photo Gallery Illustrating How To Install LED Strip Kit On Portable Canopy Tent. 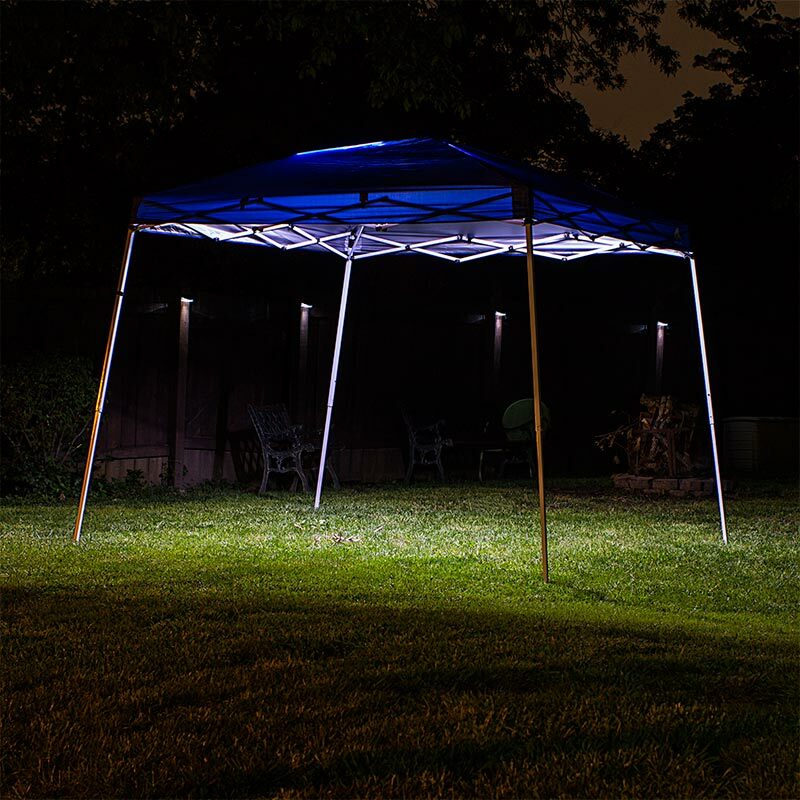 This Portable Canopy Tent LED Lighting Kit easily installs on your canopy tent, sun shelter, instant canopy, pop-up shelter, or E-Z UP Instant Shelters. It's great for nighttime tailgating, camping trips, and barbecues and is available in a wide variety of colors including "Bugs-Away" yellow. 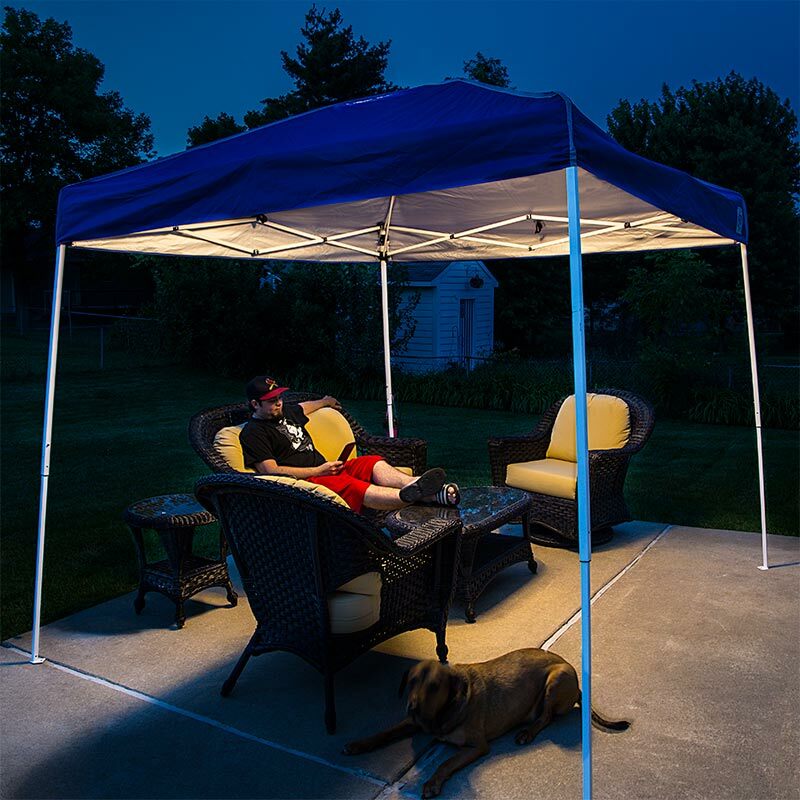 The kit includes 4 weatherproof LED strip lights that stow with your canopy tent, an 8-battery (D-cell) power supply, extension cables, connection accessories, and mounting accessories. 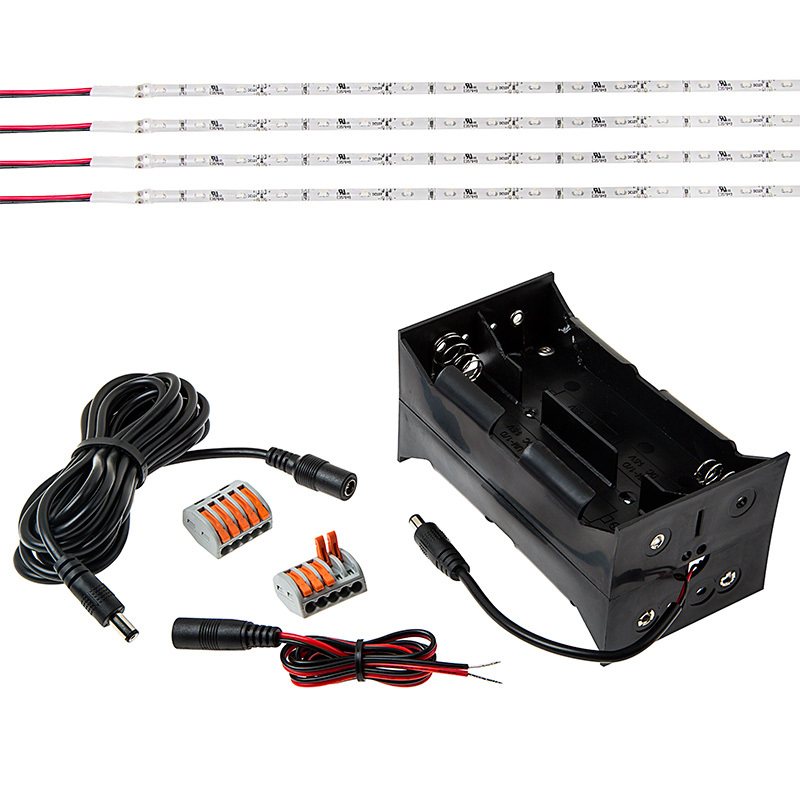 Easily install the strip lights with their adhesive backings, and use the included strap and 3M adhesive pads to mount the power supply and connection accessories. 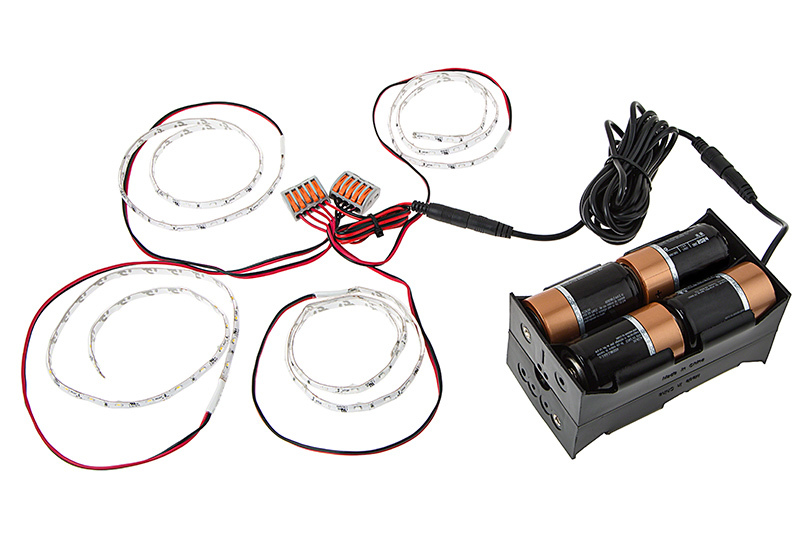 Power the LED strip lights for over 150 hours with 1 set of batteries (not included). See our installation video or download our installation guide for more information. Price per kit. Before beginning assembly, installation or operation of product, make sure all parts are present. Compare parts with package contents list and diagram. If any part is missing or damaged, do not attempt to assemble, install or operate the product. Contact customer service for replacement parts. Estimated Assembly Time: 5 minutes. 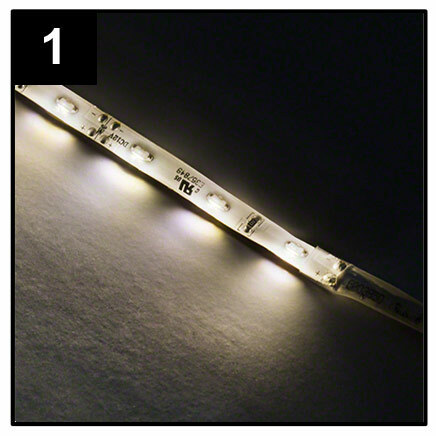 The strips included in your kit are weatherproof, side emitting LED Light Strips. 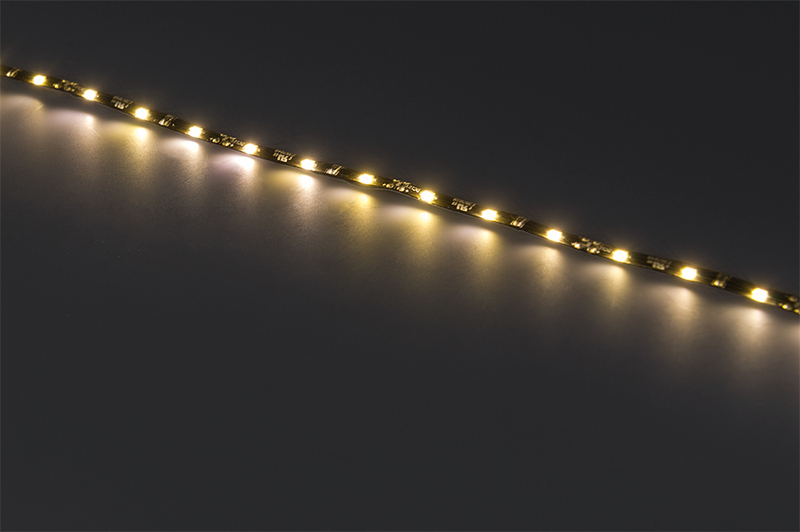 To determine which side of the strip the light is emitted, starting with the connection wires, trail the LED strip away from you. With the strip positioned this way, light will be emitted from the left side. It is a good idea to mark this on the strip. Open the metal frame of your portable canopy. 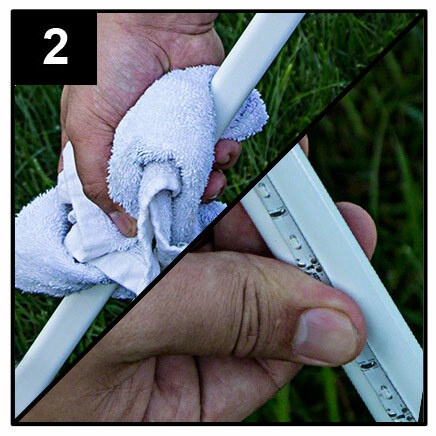 Clean the surfaces of the four innermost ceiling supports. Only use surfaces that do not slide against other parts of your frame or canopy when opening or closing. 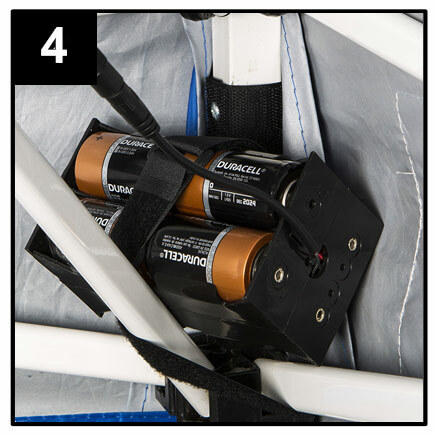 The strips should be positioned with the light emitting side pointing down and the wire connectors trailing toward the center, leaving some slack in the wires for when you want to collapse and store your canopy. Remove the wax paper tape from the back of your strip to expose the adhesive backing and install your strips. 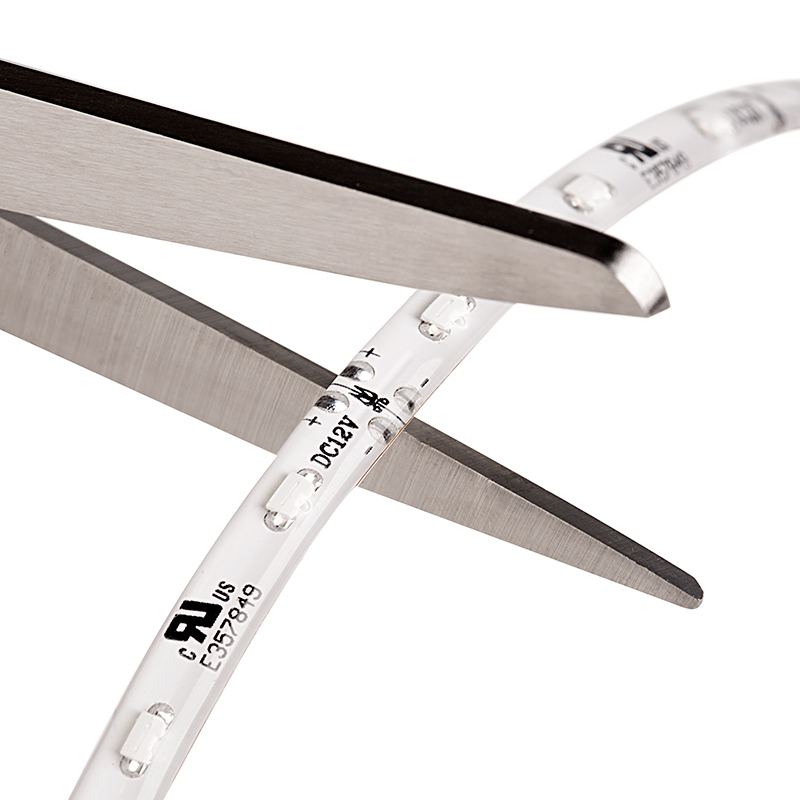 Secure the wire ends of your strips with the provided zip ties. 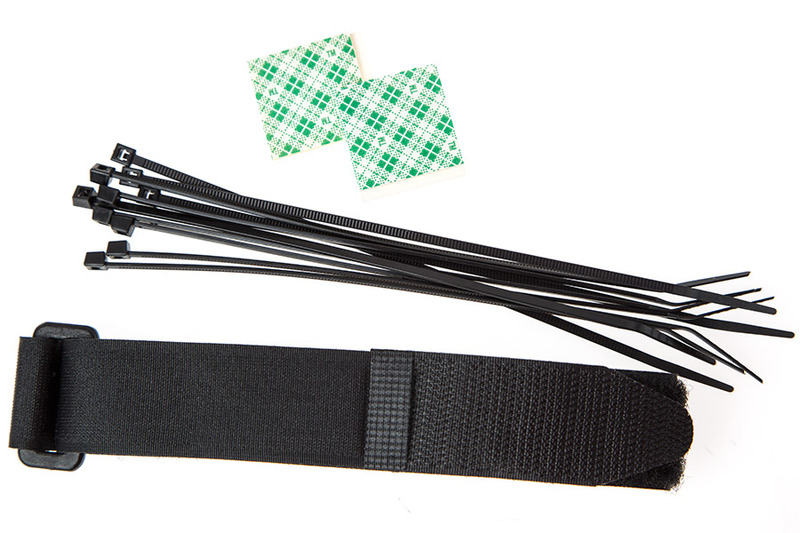 Secure your power supply in the corner of your canopy with the velcro cinch strap. 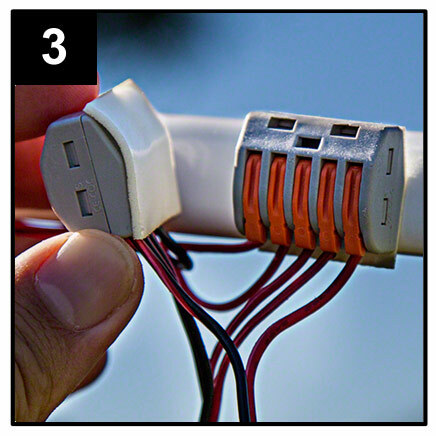 Connect the power supply to the CPS-PT Adapter with the CPS extension cable and secure this cable using the remaining zip ties. 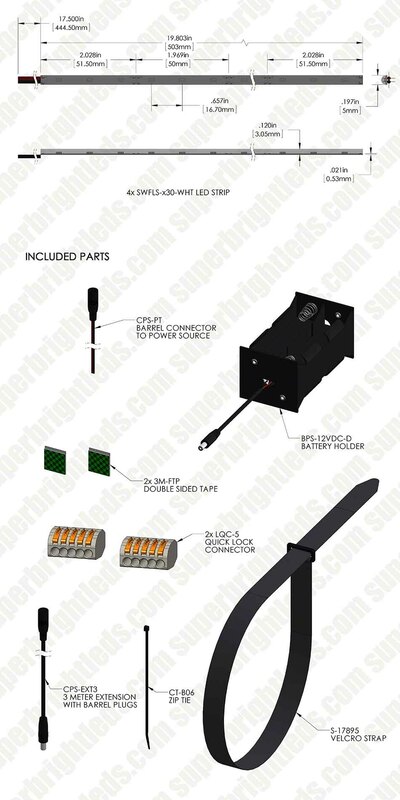 Optional: Our recommended controller, MLD-5A-CPS, connects in-between the power supply and the extension cord. 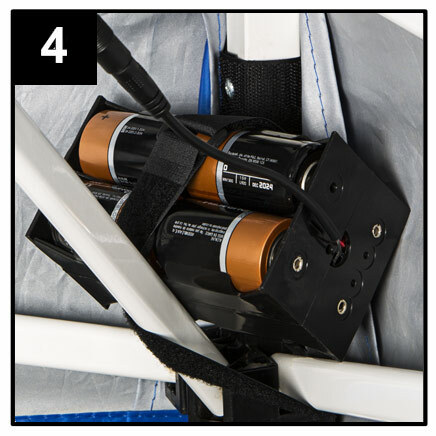 When you are ready to stow your canopy, simply remove the power supply and fold your canopy as usual. I installed this kit along with the optional mode-on/off switch on my E-Z UP 10X10 canopy. Installation was easy and the lights are plenty bright. The instructions were very good but as they say "A picture (or video) is worth a thousand words". Easy to install, and very bright. Product is exactly as shown, I need lighting for face painting and have tried different lighting but this worked great and is well worth the money. Very happy with this product and will be recommending it to other painters/vendors. Instructions on the Lever-Lock Quick Connects could have been better. Wasn't sure about the levers, if I pulled to hard would the lever break? Other then that I think they are great! Will be buying more of these beautiful and easy to install lights. Very easy to put onto tent canopy frame. Good instructions. I am an art vendor at outdoor events that sometimes last until evening, and I needed a general lighting solution. This works for me!